Today Essie Canada‘s Winter 2012 Collection “Leading Lady” is available in stores. I have to say that I’ve tried all of the colors and I’m love with them all! I adore the bold, sparkly hues that cheer me up on a dark, dreary winter day! For our Ladies Night Out Event at Shoppers Drug Mart, I created a fun holiday look on my nails with this collection using “Snap Happy” and “Beyond Cozy”. “Snap Happy” is a vibrant red with slight orange undertones….bright and cheerful! “Beyond Cozy” is a sparkly lacquer with champagne tones that can read gold or silver depending on what you pair with it. Here’s what you’ll need…painters’ tape, base coat, “Snap Happy”, “Beyond Cozy”, top coat, orange stick. Step 1 – Make sure that your nails are clean and free from oils and lotions. It’s a good idea to wash your nails with soap and water and ensure they are dry before you start. Step 2 – Brush on a layer of base coat. I used Essie’s “Grow Faster”. Step 3 – Put on a coat of “Snap Happy”. Use the orange stick as required to remove polish from the skin around your nails. Step 5 – Brush on a coat of a quick dry top coat. I used Seche Vite’s “Dry Fast Top Coat”. Let dry for at least 30 minutes. Step 6 – Cut small pieces of painters’ tape. Use the straight edge of the tape to create a line from the middle of your nail at the tip to almost (not quite) the corner. Painters’ tape works well as it’s just sticky enough but not too sticky so it won’t damage the polish underneath. Make sure to push the tape down at the “almost corner” and at the tip so that you get a nice clean edge. 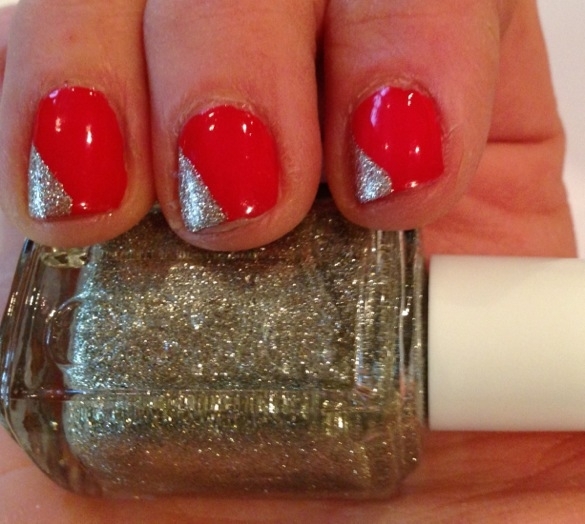 Step 7 – Put on a coat of “Beyond Cozy” on the exposed triangle of each nail. Step 8 – Put on a second coat of “Beyond Cozy” as above. 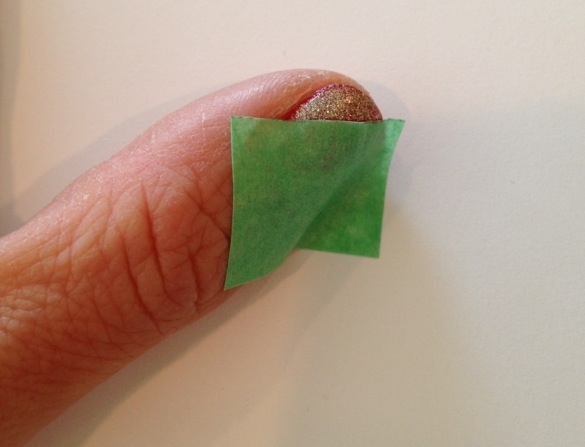 Step 9 – Peel off painters’ tape and then let dry 5-10 minutes. Step 10 – Add a final coat of top coat. To prolong your pretty holiday nails, brush on top coat each day. If you use a rapid dry top coat such as Seche Vite, it dries in just a couple of minutes, but do be somewhat cautious for a bit!